A thin solvent based liquid which removes paint from gummed up and old hardened brushes. Works on all paint types and is water washable. 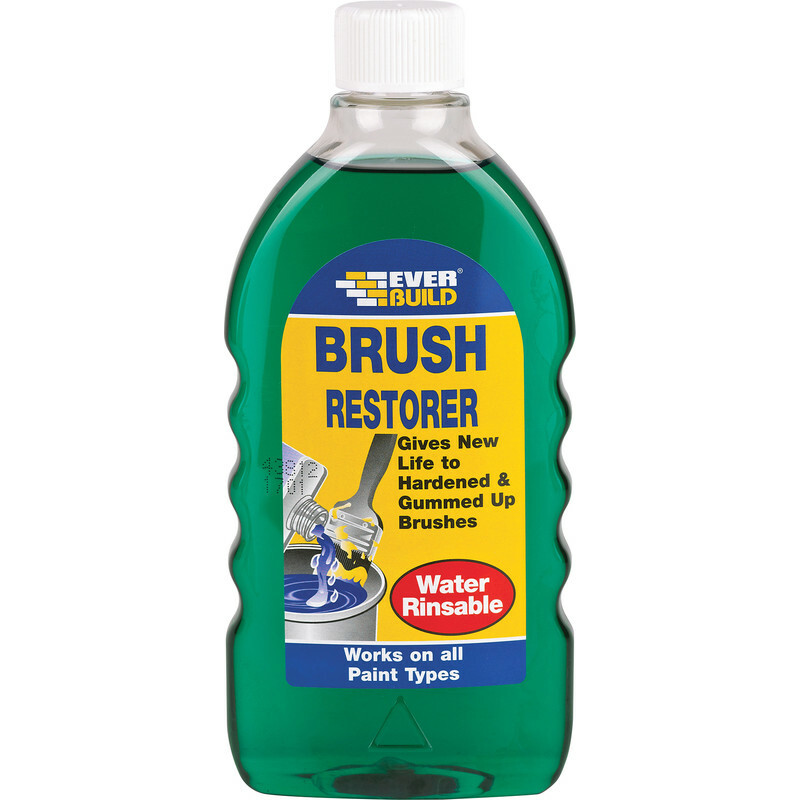 Brush Restorer 500ml is rated 4.1 out of 5 by 14. Rated 4 out of 5 by Varne from Does work well but .... old, stiff brushes need soaking for a few days with occasional agitation. Then soak again in a very strong solution of hot water and washing powder for a day before rinsing out. Also excellent for cleaning up vinyl boat fenders. Ever Build stuff is always excellent value. Rated 3 out of 5 by Herb from Okay I suppose Bought this as I had one or two brushes that were still okay to use but I hoped to give them a good dunking. It didn't do a great deal of cleaning, but I wasn't too disappointed because as I say the brushes weren't clogged up or anything. My only gripe would be that the lid wasn't fully seated so I could smell the liquid as soon as I started to open the box (not impressed). Maybe that was why there was a plastic bag over the bottle! Rated 5 out of 5 by Tim Bradford from does what it says Not used this make before and very pleasantly surprised when it did just what it said it would do; restored the brushes up a treat. Cleans effectively as well on brushes fresh from painting. Lasts well - a little goes a long way. Good value. Rated 3 out of 5 by hqfglqwghflqkhgwe from It's OK, but white spirit does the same thing Used on a Purdy brush I'd used for applying Barrettine wood preservative which is oil and solvent based and you can generally clean it off with white spirit, but I had a bit of dried stuff at the handle end of the bristles. I left this in soak over night and then for a few days, but it did not soften the dried on wood preservative very well. I used white spirit in the end and a brush comb, much quicker and more cost effective. Rated 5 out of 5 by Woolly from EXCELLENT BRUSH RESTORER Bought two bottles to try to restore caked brushes that I had tried to clean with white spirit & Polyclens but with little success. I soaked 9 brushes overnight, covering up to the top of the bristles and using one bottle in two containers. I then brushed them through with a stiff wire brush and then rinsed them in warm soapy water...MAGIC...brushes like new! Highly recommended! I have filtered the liquid back into the bottle so now have much of the used liquid and an unused bottle for my next batch of brush cleaning/restoring. Rated 2 out of 5 by Anonemous from Not impressed Toolstation have an annoying habit of using large amounts of sellotape on paint lids and bottle caps. This leaves a gooey mess all over the bottle/tin. Not only that, it's always stuck right on top of the product labels which then get torn off with the tape and cannot be read. As for the brush restorer, the bottle I tried took ages to do anything at all - i.e. over 48 hours soaking one brush that had been used with Dulux satin wood paint. Not recommended at all.